With so many extraordinary attractions in the USA, it is easy to overlook places like Chattanooga, Tennessee. For some, mostly older generation, it is only known from the Choo Choo Train song while for others, it is just a hard to spell word. But once you visit, you will quickly realize that there is no justice in the city’s lack of popularity. Chattanooga is not only an interesting destination to visit but also a great place to live. Credit Card TravelingMom fell in love with this city and she thinks you will too. 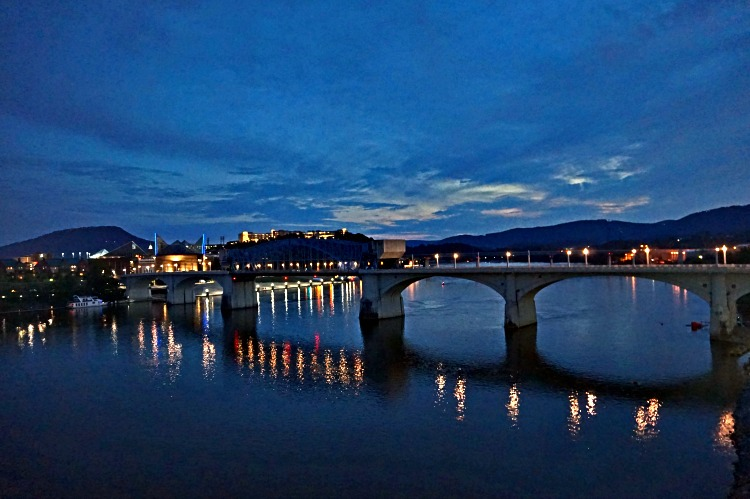 Read on for 16 reasons to fall in love with Chattanooga. What I knew about Chattanooga was both, the Choo Choo part and that I had no idea how to spell it. But I never miss an opportunity to see new places. I was thrilled when Chattanooga Conventions & Visiting Bureau invited me, and three other travel writers, for a five-day adventure. 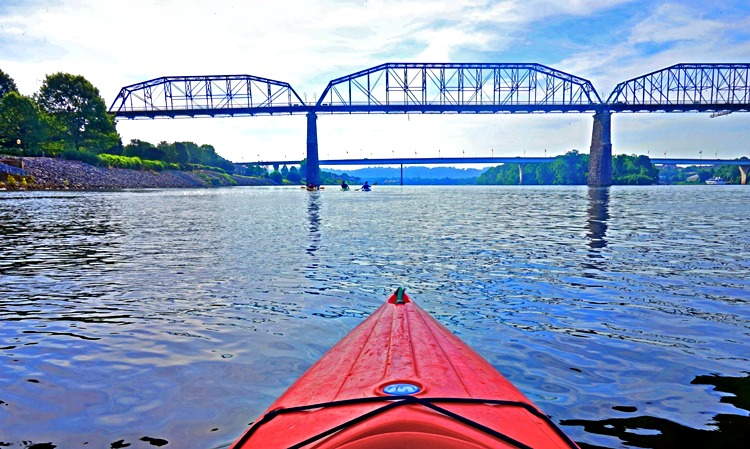 We focused on Chattanooga’s outdoor and adventure but along the way, we explored all its major attractions. I would do no justice to this friendly city if I only mentioned its outdoor allure — included in the following reasons why you’ll fall in love Chattanooga too. When thinking about kayaking, I picture myself far from civilization. In Chattanooga, for the first time ever I experienced urban paddling. If it was not for my muscles at work, it felt more like a sightseeing cruise than a kayaking trip. We paddled along the banks of the Bluff View Art District, under scenic bridges, and around Maclellan Island bird sanctuary. I really enjoyed this interesting mix of city vistas and birds flying over my head. 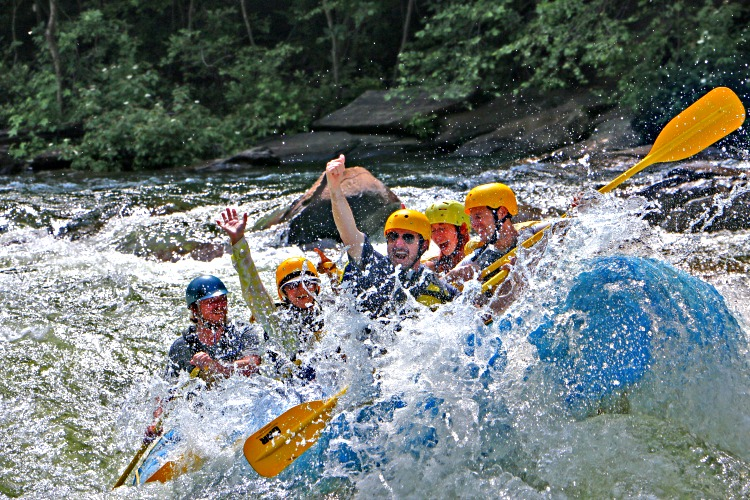 Outdoor Adventure Rafting hosted our whitewater adventure. The trip was thrilling but safe and very well organized. Our guide entertained us with jokes, splashing, and turning our raft around…not always on purpose. This mostly a fast pace ride offered enough breaks to enjoy the beautiful scenery. Great adventure! 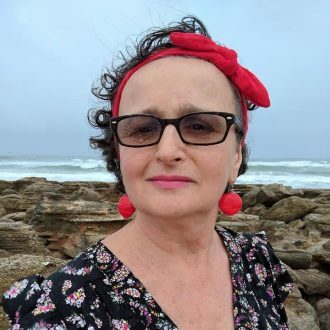 At almost 60, I challenged myself to try this aerial adventure. 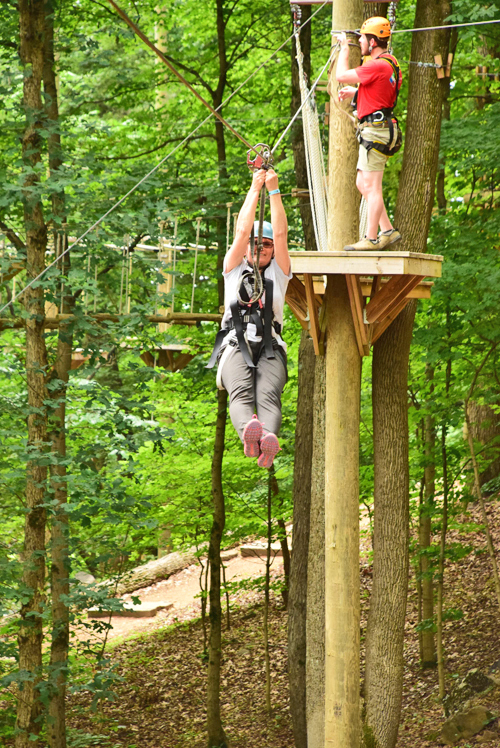 I zip-lined before but a suspended obstacle course among trees was never on my to-do list. The fact that I am afraid of highs did not help much. Still, being with people significantly younger than I was, I represented my generation with all bravery I had. I not only survived but I had a lot of fun. Judging by my aches next day, it was a full body workout. 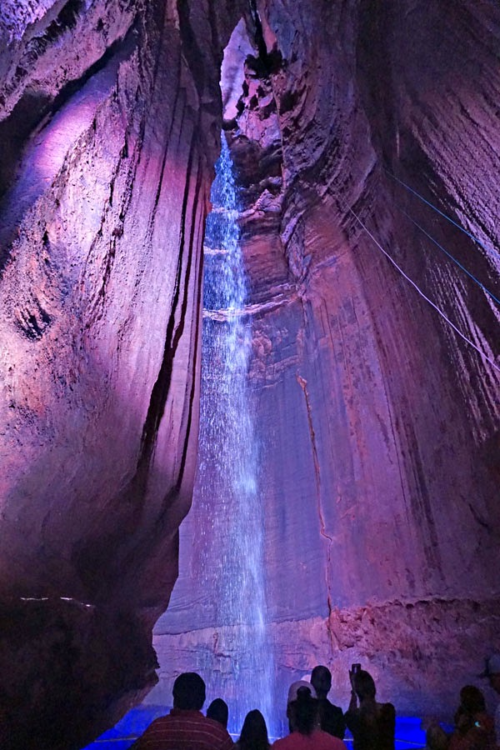 Next door to the Aerial Adventure, the amazing journey will lead you to a marvel of geological formation, 145 -foot America’s largest and deepest underground waterfall. The tour was nice and informative, but in my opinion, way too short. It did not allow for taking a lot of photos. I especially enjoyed colorful fall illumination. 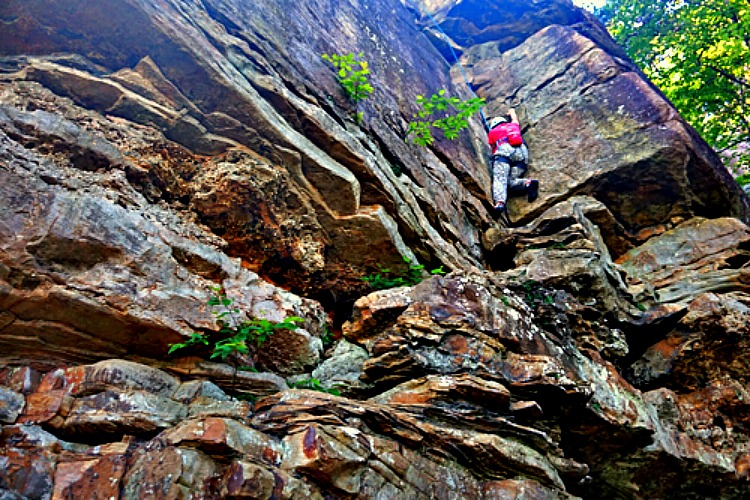 Chattanooga is a popular destination among rock climbers. All around the city, there are miles of picturesque sandstone bluffs challenging to even the most ambitious climbers. At first, I said “no” to this adventure. My thought was, I would only go to enjoy the views of the area and watch my young friends trying to kill themselves. Just the beautiful hike to the climbing spot would be satisfying enough for me, or so I thought. Instead, I felt jealous watching the fellow writers having fun, so I quickly changed my mind and tried it anyway. I am glad I did. Although this will not become my future hobby, I now understand those who love this kind of adventure. The aquarium is the city’s top urban attractions. 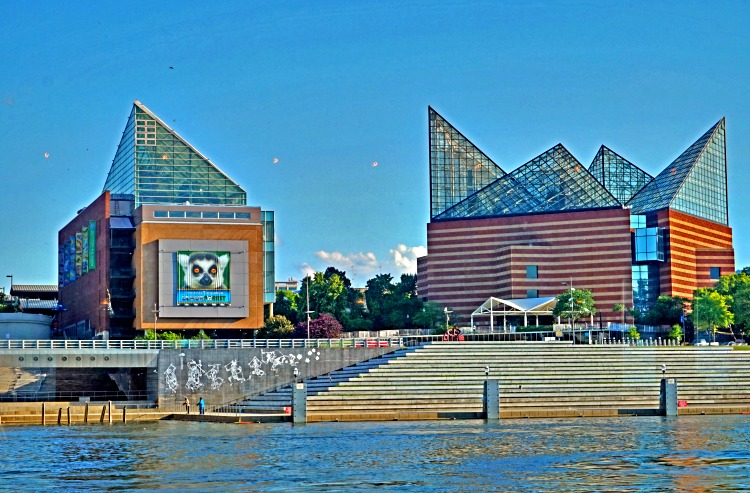 Located on Chattanooga’s downtown riverfront, the Tennessee Aquarium invites visitors with its beautiful setting. Inside, learn about River Journey, a fascinating adventure following the path of freshwater from the mountains to the sea. Experience two exhibitions: fresh water and salt water. Meet otters, alligators, catfish, turtles, penguins, stingrays, beautiful butterflies, and a spectacular coral reef with big sharks and schools of fish. It is a fun place for people all ages. One of the top city’s attractions, the Southern Belle Riverboat cruise is a relaxing way to view the most scenic parts of Chattanooga. The riverboat has three decks for your enjoyment. Sightseeing, lunch, and dinner cruises are available. Even if you are not into music, do not miss this Chattanooga’s new attraction. 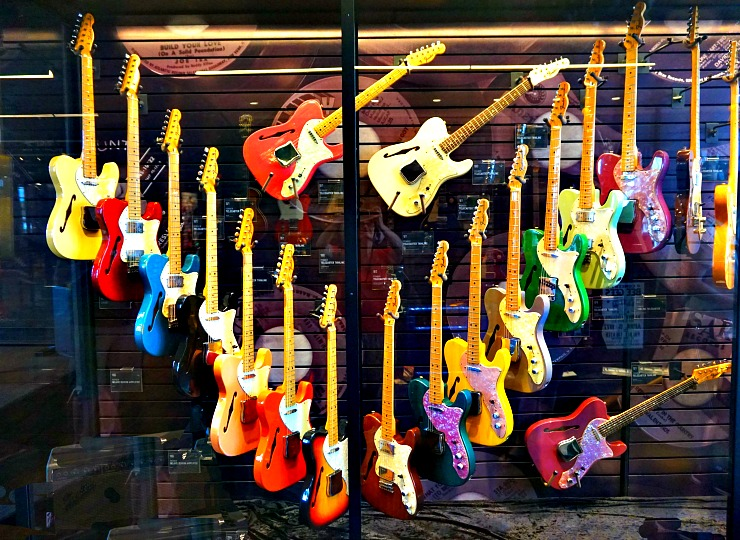 Here you could see some most prestigious guitars in the world. You will be impressed by the beautifully displayed collection of more than 1,500 instruments grouped by brand, time frame, and models. The site also hosts music performances and special events. 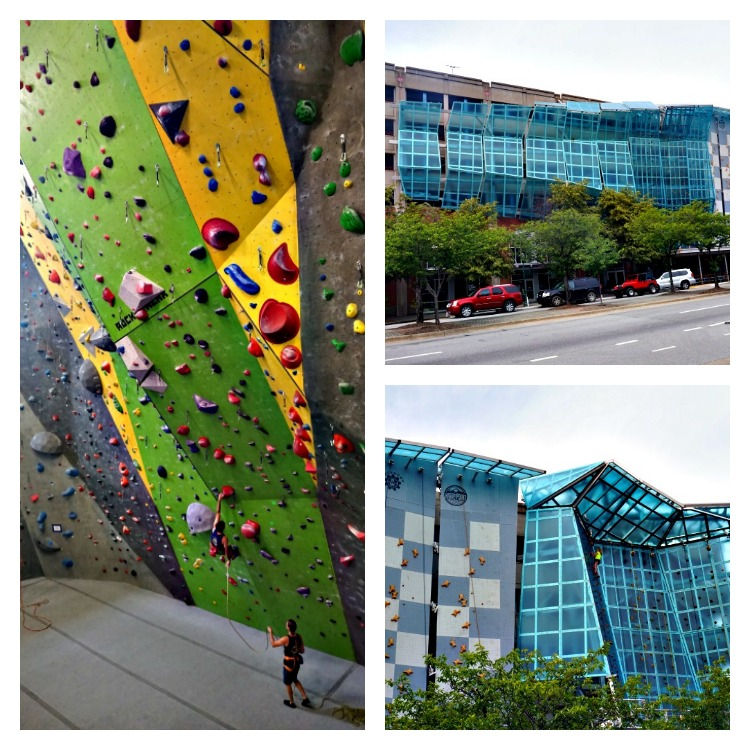 This nation’s largest gym is a paradise for wall climbers with 30,000 square foot of climbing and bouldering space. You can even climb outside on a transparent climbing wall! Climbing experts love the gym, but it is an adventure for everyone. Even young kids can try their skills in a safe and fun environment. It looks so easy when you watch others climbing, but I quickly realized it was not an activity for me. I was blown away by the choice of places to eat. From a small ice cream spot, like crowd’s favorite Clumpies, through a Tex-Mex delicious cuisine at Taco Mamacita, to Hennen’s – an upscale sophisticated restaurant, you can find it all in Chattanooga. 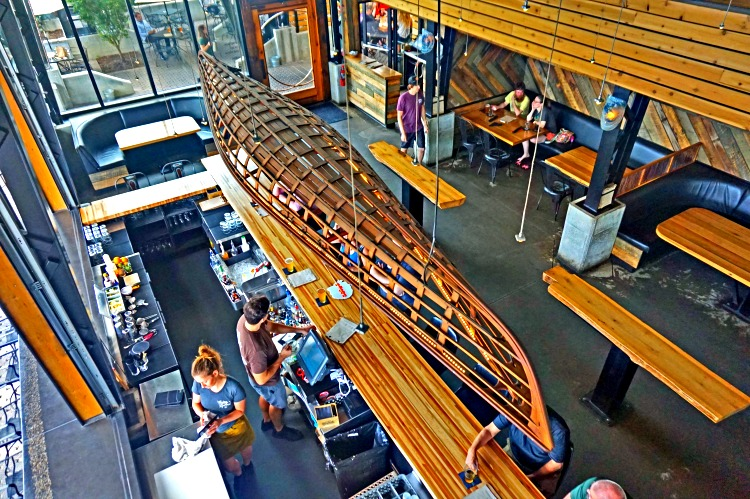 My favorite was the Boathouse Rotisserie & Raw Bar, located at the Tennessee Riverwalk. An outdoor patio, beautiful sunset, great food and fabulous company – what else could you ask for? For drinks, I recommend Flying Squirrel Neighborhood Bar. Its modern hip design, good food, and very friendly service left a lasting impression. Expect young crowds there since it is next door to The Crash Pad, a lovely stylish hostel. Chattanooga can accommodate a variety of travelers. I stayed right on the Tennessee River at SpringHill Suites by Marriott Chattanooga Downtown/Cameron Harbor. My suite was gorgeous. The best part was a large balcony overlooking the river. Young people visiting the area for its outdoor adventure will feel at home at beautiful but inexpensive The Crash Pad hostel. Its grounds are so inviting, they host wedding ceremonies. 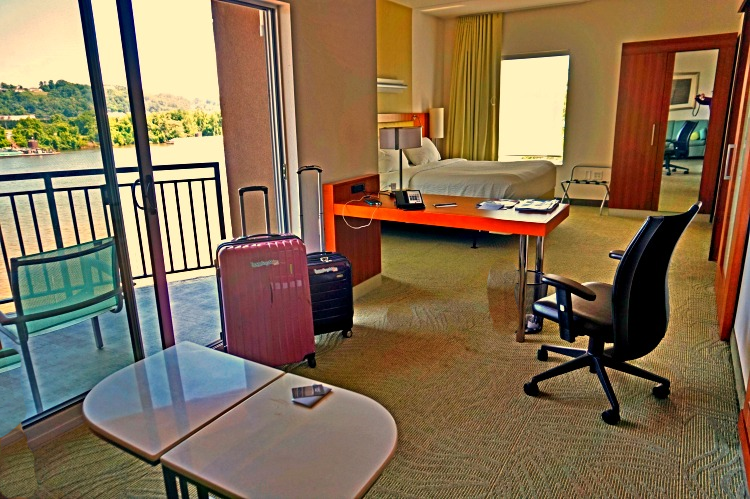 For families on the budget, The Chattanoogan Hotel is a great choice. The best way to discover the city is by walking. You might stumble upon something that strikes your senses, like a little gift shop, wall murals, ice cream place, or a great restaurant. Chattanooga Biking Transit System is available to those who prefer to ride a bike. For $8, purchase a 24-hour pass with unlimited 60-minute station-t0-station trips. With 300 available bikes and 33 stations strategically placed around the city, you will be able to visit all its major attractions. If walking or biking does not excite you, a free electric shuttle will come to the rescue. Voted among the best public markets in the country. 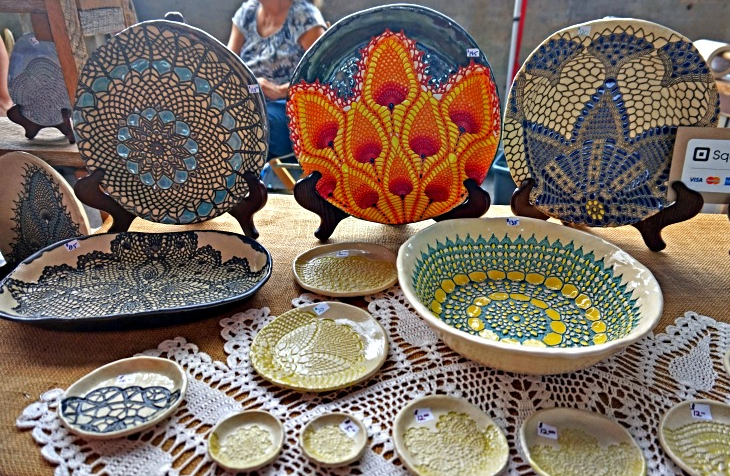 No wonder why, Chattanooga Market features the best-handcrafted works by local and regional artists, local produce, live entertainment, baked goods, and street food for hungry visitors. The pavilion is open every Sunday, April 30 through November 19th from 11 AM to 4 PM. Each week there is a different theme. During my visit, I enjoyed Strawberry Festival featuring strawberry salsa, cakes, lemonade, jelly and my favorite, chocolate dipped strawberries! Open for cyclists, joggers, skaters and walkers, this concrete liner park offers 13 miles of great views, wetlands, fishing piers, picnic areas and more. It is popular with locals and visitors alike. What a great place to take a stroll and enjoy the views of the Tennessee River. It is the longest pedestrian walkway in the world at 2,370 feet! 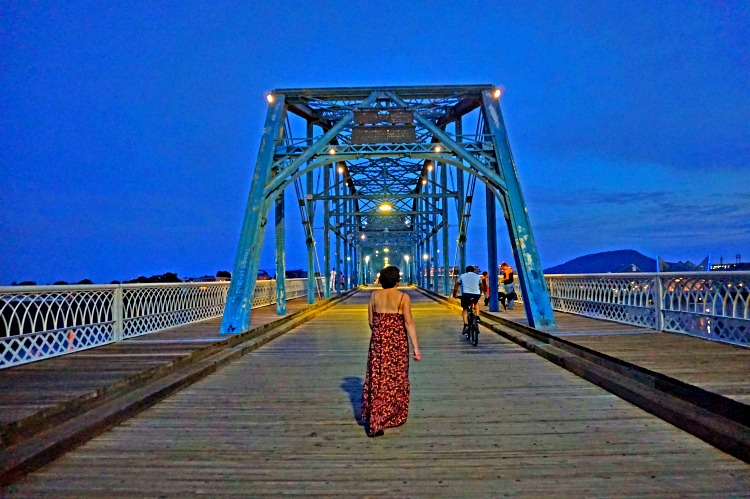 For me, walking this charming bridge was a relaxing way to say goodbye to lovely Chattanooga. People of Chattanooga initiated their city’s revitalization. They carried on their local pride from generations before. They poured their heart and their money into the project. 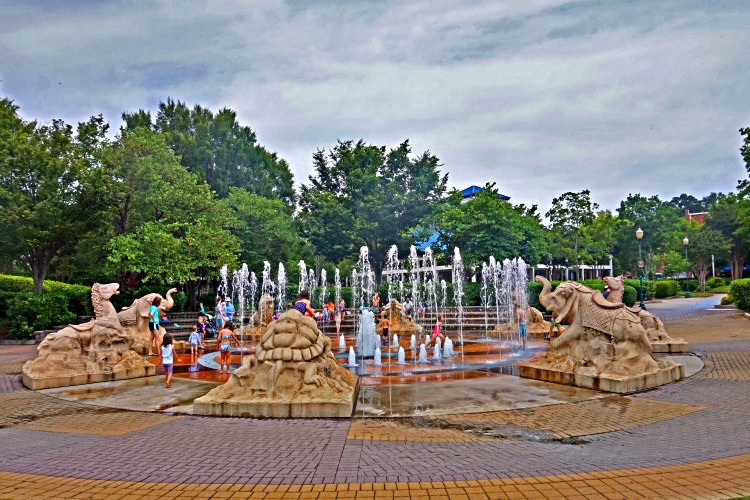 Chattanooga offers many things to do with kids. Little parks, splashing pools, walking and biking trails were designed with local people in mind for their every day enjoyment. Residents of Chattanooga love their city and open up their arms with pride to city’s visitors. There are a number of unique attractions on lookout mountain. Rock city, the incline railway, and a civil war battlefiel to mention a few. Thank you! I will make sure to check them out next time I visit. Great article! I will have to try some of these! Thank you! I hope to come back to Chattanooga soon. I know where to stop on the way!